Many of the MotoGP teams took part in a two-day test at Le Mans in France, immediately following the French GP. After three days of wet racing, the riders started late in the morning to take advantage of a completely dry track. From unofficial lap times, the fastest rider was Marco Melandri with 1:33.70, ahead of Carlos Checa and Valentino Rossi. Melandri was concentrating on RC211V settings, new helmet venting, and a new radio system. Ducati riders Checa and Loris Capirossi worked with a new clutch, a revised rear suspension linkage and new engine mapping. The Yamaha duo of Rossi and Edwards tried new engine parts and mappings. 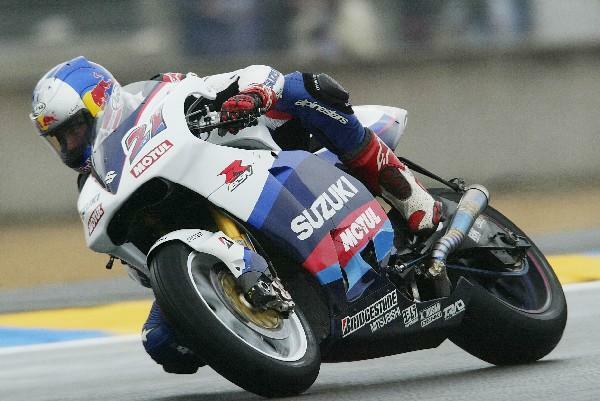 The Suzuki squad focused on testing a new Bridgestone rear tyre and a new chassis for the GSV-R. The tyre proved to be an improvement over the current rubber, as well as showing consistency. Meanwhile Kenny Roberts Jr used the new chassis which Hopkins had preferred throughout the race weekend. Nicky Hayden was the lone Repsol Honda rider due to Max Biaggi's warm-up crash before the race on Sunday, and the test also marks the official end to Olivier Jacque's stint with Kawasaki, although new plans are revealed in MCN, out May 18.